Product code: ES8202 Categories: Sold Items, Sold Rings. Here is a truly exception antique emerald and diamond ring from the 1700’s that is set not only with a spectacular quality emerald, but also the incredible rare and hard to find antique Mazarin cut diamonds. Hand made in 18 carat yellow gold and silver, silver was used to set diamonds into until the early 1900’s as until then white gold was not yet invented and platinum, although already discovered, was not used in jewellery until around the same time as white gold. In the centre is a spectacular Colombian emerald that not only has such an intense green colour but also incredible clarity that allows you to see right through the emerald. For centuries Colombian emeralds have been regarded as the best in the world and this one really shows why. Measuring 1.50 carats in weight, it has the most perfect colour and clarity that is so prized and this emerald will truly stand out when compared to so many others. And then there are those beautiful and rare Mazarin cut diamonds that surround the emerald and even continue onto the band. With twelve diamonds surrounding the emerald and the additional diamond set on each side, the diamonds total 0.49 carats and are really like no other. The setting of the diamonds has that wonderful look and feel to it as does the fancy style band that is set with the extra diamonds. From every angle this ring is just amazing and has such a unique and beautiful style that no modern ring can ever compare to and is destined to always be admired and such a wonderful and amazing talking point. Tag: Antique emerald and diamond ring. 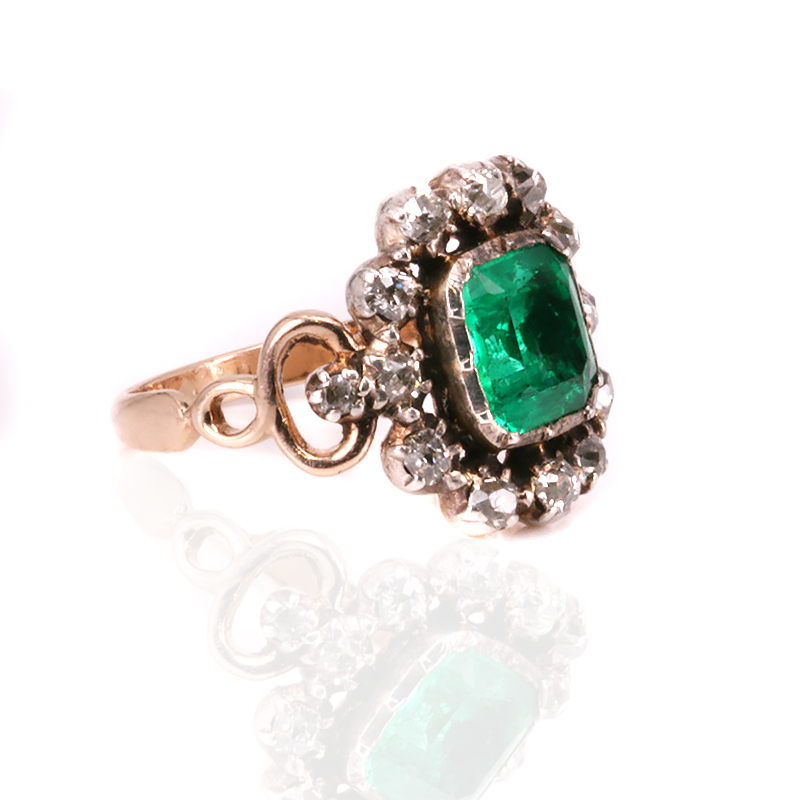 This antique emerald and diamond ring is set with the very rare and hard to find Mazarin cut diamonds. Developed in the 17th Century they are one of the earliest form of diamonds that can be found with both a crown and pavilion. Set with a Colombian emerald in the centre, Colombia has long been regarded for centuries as the producer of the best quality emeralds in the world. Often with superb colour and clarity, it is often easy to see why they have been so sought after.